There’s a really good piece in the current Variant (Issue 42 | Winter 2011) which collates some critical feedback on the interview that Variant – in the shape of Daniel Jewesbury – conducted earlier this year with Creative Scotland’s Chief Executive, Andrew Dixon (Variant 41 | Spring 2011 http://www.variant.org.uk/issue41.html). Much of the published feedback and negative criticism of Dixon’s position and argumentation as presented in that article, and of Creative Scotland’s Corporate Plan, is centred on the incontrovertible issue of the non-neutral status of language – ‘Language is Never Neutral’ is the title of the article. So, criticism of Dixon and the Corporate plan is often based on the assertion that changing ‘funding’ to ‘investment’, for example, is going to be inevitably much more than a semantic exercise; for even if in the first instance the switch in vocabulary does not effect a drastic change in practice (and CS are still committed in Jewesbury’s interview to invest in the individual artist’s project on the artist’s terms) as sure as eggs is eggs the change in vocabulary will see in due course a concomitant change in attitude and spirit: a reification in policy of vocabular connotation. Thus, there is no benign twiddling with language when it comes to these things; twiddles lead to the inscription in policy and practice of whatever spirit lies behind the terms of supersession. Those who cry foul at CS’s plan, therefore, are minded to think that the shift in vocabulary will necessarily introduce (if it hasn’t happened everywhere already, they add) a neoliberal epidemic capable of eviscerating the autonomous being of the artist by subjecting him to a pernicious strain of fiscal virus: free-Scot mutates into hollow puppet of State. I’m not so sure about the attacks on vocabular shifts (nor about the attendant prediction of effect) – although the proposition that language is never neutral is never wrong. The problem with these attacks I think is that they require a very long, uninterrupted field of dialectical progression for the thesis to be realised; then again, I don’t think that that point just made spoils the attractiveness in theory of the attacks on vocabular shifts, and some of that theoretical attractiveness, or attractiveness in theory, is imparted by the dominance of the point about partiality of language – that is indeed an attractive point, albeit one that shys away from its ‘you don’t say’ shadow. Rather, the absence of a pragmatic purview on the corporation of CS is something which hinders the critics of ‘funding-to-investment’ parlance. In Variant’s compilation, AHM offer an interesting take. Their line of attack evolves into a pragmatic questioning of the potential impact of the strategic change inherent in Flexible Funding moving to Strategic Commissioning, thus, their contribution is intriguing because the possibly-obligatory anti-capitalist vocabulary which they deploy in the opening of their piece to assault the catch-all demon neoliberalism yields to a concern, not for the durational impact of Dixon’s lexicon, but for the immediate and mid-term operational viablity of a new strategic approach. 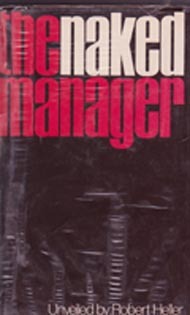 ‘The Naked Manager’, Robert Heller, London: Barrie and Jenkins, 1972. Call up legendary business analyst Robert Heller here: ‘The planner and the manager are both dead in the long run. The long run, however, is only a series of short runs added together’. Heller went on: ‘the first responsibility of the manager is to the here and now’. Of course, horizon scanning, scenario planning, and such like, are important in securing corporate health, but if too much time is invested in the distant, projected contingencies, not enough time is invested in addressing what’s what in the here and now. The Variant article shows in some ways, for me at least, that the dissenters are perhaps too intent on playing a mirrored long game, awaiting that magic moment when one can point to, not the neoliberal flip chart, but the neomarxist flip chart and claim one’s horizon scanning raffle ticket. It’s not, then, that language is neutral, and all we need worry about is today’s task list: on the other hand, it’s not, then, that partiality of language will necessarily bring about a concretising of neoliberal values to the detriment of true Scottish artistic practice in the long run. And if we wanted to set up a square go between the languages of managerialism and cultural leftism, which one would win over the mangled other? I have always been struck by a self defeating sense of entitlement that can be found in some parts of the Culture Industry. I was once chastised by Douglas Hall for wanting to be a service provider/visual artist and while his argument against Artists being cast as service providers might come from a different place as where I’m going with this rambling reply, I think it important to develop strategies which free Artists from economically paternalistic structures. Grants, Funds, Bonds all have both negative and positive connotations dependant on context. One has to ask if Culture Scotland’s plans have ever really diverted from being something of a marketing tool for Scotland PLC. It’s not like Artist’s will just stop making art. To tersely (mis)quote Marx(? )…I remember this being written on the wall in John Baldacchino’s office… “I am suspicious of systemisers and those who submit to their systems”. So – in a nut shell what I am saying is – what is the real threat to creative output? Fascinating ideas are always going to be produced and presented in a myriad of media. The voices which find a way to communicate out with and beyond conventional channels will be all the stronger as a consequence of the current mire. I’m somewhat estranged from contemporary academic cultural debate but this, if anywhere is the kind of suitable forum where I should be able to comment. Ken, I’d be interested to know how you feel this all plays out on a wider political field given the potential for an Independence referendum. In the here and now, what is the purpose of the Culture Industry? Did we ever have it right in the the first place? Does anyone? Thanks for those comments, Justin. I’m fairly unconcerned by systematisers and systems, along as together they deliver to requirements. I don’t doubt though that corporate bodies could do better in finding systems which allow for greater free play and autonomy on the inside for individuals and agencies, within ‘hard rules’. I guess my blog here wonders about the often assumed inevitable failure of current systems based on the assumer’s interpretation of the significance of the particular non-neutrality of language – my points above maybe try to wedge those two elements apart in response to Variant’s compilation. It’s not that CS is doomed because of a vocabular shift – any more than a manager is doomed for adopting with too much alacrity the ‘going foward’ vocabular range from booreau central. What counts is what counts – the extent to which the system ‘delivers’ for creatives and audiences in Scotland, now and into the next few years: that to me is more important than an ideological point about an inevitable, but distant, decline in spirit or something. Attached to that is my growing anxiety on behalf of creatives and thinkers over the pat use of off-the-peg anti-neoliberal vocabularies. These tend to be deployed as much as statements of cultural pedigree as methods of actual critical inquiry – there’s too much cosy affirmation of position surrounding that non-neutral vocabulary, and I was setting the two ‘pats’ side by side – the managerial dictionary and the dictionary of what is sometimes called the cultural left. It isn’t right to read CS as pernicious and neoliberal on the strength of a linguistic shift – and, in any case, the organisation is a million miles away from an unfettered neoliberal corporation (partly because of its centrality as a delivery mechanism of government). AHM begin with some indulgence in pat critique by using the neoliberal route, but recuperate the critical inquiry by wondering instead about the mechanisms of delivery – that’s where attention should be focused, and where the arts and cultural community should seek revision and refinement.